Over the years I have learned about where to find and buy fountain pens in this city. The summary of my findings is this report. But by no means is this list complete. Photography and other “otaku” goods with a small section of pens. It occasionally offers discount prices for new goods. Interesting shop with marked prices. Vintage pen shop in Tokyo. Pelikan and Montblanc are the main brands on sale here. Japanese pens also available. Prices are not marked. The owner, Eizo Fujii, speaks excellent English. (These are just the usual opening days. Checking the website is a must in this case). Small shop dedicated, mostly, to foreign pens. This seems to be the place to go to buy Soennecken pen in Tokyo. The section on Japanese pens is very limited. Prices are not always marked and some unpleasant surprises have taken place. 4. Map Camera-Kingdom Note (Used pens. New pens at catalog prices). Very nice shop in the 6th floor of the Map Camera/GMT building. Excellent service. Montblanc and Pelikan pens take 30% of the space. Some Japanese pens also on display. Big art supply shop with a decent department of fountain pens and fine writing utensils. This shop has a 20% discount price on its products by default. With the membership card (JPY 500 for two years) the shop issues vouchers for a value of 7% of the total amount spent redeemable on the next purchase. The main store is in Shinjuku (5A), and on the West side of the station there is a smaller branch (5B). Inks are more accessible on the later. Takeya General Discount Store, this is its full name, has a small stationery department, but its prices are very good--discounts over the catalog price of over 30%. These are some of the brands available in there: Parker, Pelikan, Montblanc, Lamy, Sailor, Platinum, Pilot. The stationery is on the ground floor of building 8. Under the tracks of Yamanote line between Okachimachi and Ueno stations there is this big market where you can find almost all kinds of goods. Among them, four shops where you can find pens with discounts between 30% and 40%. They are focused on imported pens, but in some of the shops (Ameyoko Mito, Marui, and Tachibana, at least) you can also find Japanese brands with discounts around 20 or 25%. See map for the location of Ameyoko Market. Might be closed (Feb 2017). See map under the tracks. 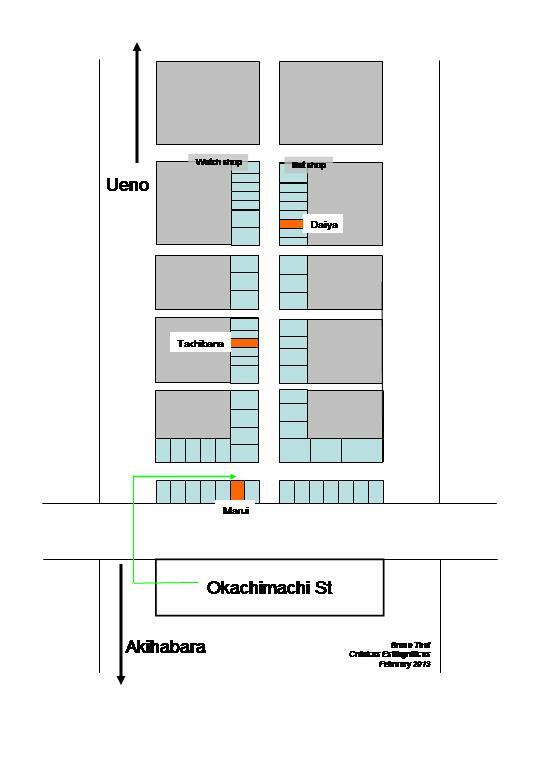 Location of three of the four pen shops in Ameyoko Market. Many shops, including most department stores carry fountain pens. Most of them at regular catalog prices. Eventually, it might be possible to find some “New Old Stock” (NOS) pens on them. Following there is a selection of some of these shops. Maruzen is a bookshop with a large stationery section. It has a number of branches, most of which carry fountain pens at regular catalog prices. Among those, the head office in Nihonbashi, and that in Oazo Building in Marunouchi are the most interesting. Maruzen carries its own brand of ink (Athena), and of pens (Century), and there are some special editions of pens by major companies for this shop alone. Very traditional, and very old (founded in 1663), Japanese stationery. The main branch is located right on Ginza crossing. It has a small selection of Japanese and foreign pens. 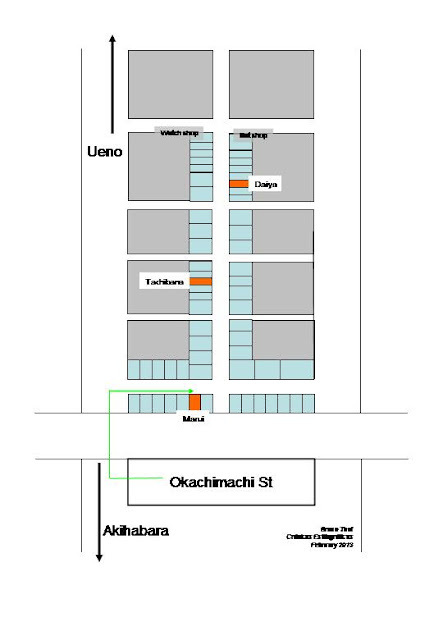 Location of pen shops in Ginza: Lemon, Kyukyodo, Itoya, Eurobox, and Pen Cluster. Itoya is a large stationery and art supply shop. Romeo is the Itoya brand for pens. Taccia Pens, made by Itoya, are also available here. They also have special editions for them alone. Technical service available. The main building has re-open in July 2015. In Fall of 2016 the pen section was moved to the third floor of the main building. CLOSED DOWN on April 1st 2016. This is a museum and a café owned by the pen company Pilot. There are no sales in here, but they provide a repair service for their own brand. Probably, the most beautiful pen shop in the world. And that makes a real experience to visit and, eventually, to buy a pen in here. Importers of Noodler's inks in Japan. The website also includes a section on second hand pens. The very attentive clerks will take the used pens out if asked. Shosaikan also has two branches in Haneda Airport, on terminals 1 and 2, not covered on this list. This is a very small shop run by a nibmeister who tunes and adjusts pens –smoothing the nibs, altering them in some special way, etc. The selling price is the same as in other shops. Higashi Oi is near Oimachi station along the JR Keihin-Tohoku line. Traditional pen shop located in bookshop-rich Kanda district. Mostly imported pens at regular catalog prices. The owner seems to tune the nibs of the expensive pens. Tsutaya is a big chain of bookshops, stationeries and, mostly, video and CD rental. This particular branch has a beautiful section of fountain pens. Mo-Su: 7:00-2:00 (yes, from 7 AM to 2 AM). Keio-Atman is a big store with a number of sections. At some of its centers,the stationery department is good, and in a number of cases they are Sailor Friendly Shops. Prices are MSRP. This stationery shop no longer sells at discount prices. Now it mostly offers Pilot pens. Some Platinum and Sailor are also available. It is located on Chuo Dori, almost in front of the Pilot Pen Station, further north towards Nihonbashi. This stationery shop sells only Pilot (Namiki too) pens and includes a number of non-standard options. It is located far away from the usual pen scenarios in Tokyo. Opening hours and days: check the website. Currently (Feb 2017) very irregular. This is the small branch of the Hamamatsu-based stationery shop. It mostly offers they original products (inks and pens) plus a small selection of products by usual makers, including Twsbi, Pelikan, Lamy. Opening hours and days. Consult the website; currently (Feb 2017) very irregular.